An investigation into the cause of a serious incident involving an Airbus A320 on approach to Tel Aviv, Israel, shows the airplane’ s speed dropped below manoeuvring airspeed due to the pilot’s lack of comprehension of automatic systems. On April 3, 2012 an Air France Airbus A320 operated a scheduled passenger flight from Paris-Charles de Gaulle Airport, France to Tel Aviv-Ben Gurion Airport in Israel. There were 149 passengers and six crew members on board the airplane. The copilot was Pilot Flying. 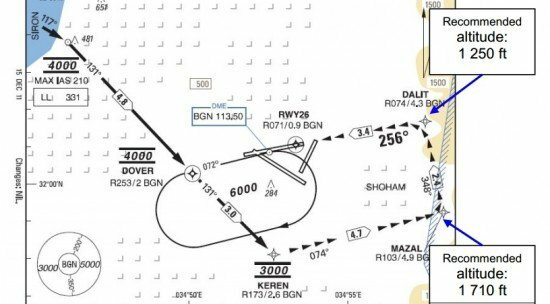 The flight was cleared to make an approach to runway 26 according to the RNAV VISUAL procedure. While at the middle of the downwind leg, the crew selected an altitude of 1,000 ft and changed from vertical mode DES to OPEN DESCENT. Engine thrust decreased to idle. Ten seconds later, the crew engaged “managed speed” and then extended the landing gear and changed to configuration 3. Several seconds later, they changed to FULL configuration which led to a decrease in speed towards the Vapp approach speed, which is 138 kt. Shortly before the last turn, at 1,540 ft, the autopilot was disconnected manually; the autothrottle and flight director remained engaged. The captain stated that he was focused on capturing the approach path and with external monitoring of an aeroplane preceding them on final. During the last turn with a bank of about 20°, the copilot made a pitch-up input for about ten seconds. During this phase the flight director command bars gave a pitch-down order to maintain the target speed with the engines on idle. Pitch attitude increased from 0.7° to 10°, the angle of attack from 5.5° to 10.9° and the speed decreased from 135 kt to 122 kt, that is 16 knots below the approach speed. The crew indicated having heard the “SPEED, SPEED, SPEED” aural warning during the turn. The copilot then carried out a go-around without calling it out to the captain and placed the thrust levers into the TOGA detent. For two seconds, the captain gave a pitch down order contradicting the pilot flying’s inputs, without pressing the takeover pushbutton on the sidestick. He indicated that he still had in mind to continue the approach. Two seconds later, the ALPHA FLOOR mode engaged, followed by the TOGA LOCK mode. The crew selected configuration 3 and an altitude of 3,000 ft. The speed was increasing. The copilot pulled back the thrust levers to CLIMB, without any effect on thrust because the TOGA LOCK mode was still engaged but the crew had not identified it. Approaching 2,000 ft, the crew selected an altitude of 2,000 ft, re-engaged the autopilot, retracted the landing gear and selected configuration 1. The crew then selected a speed of 188 kt. The speed was then 208 kt and continued to increase. As a result of its inertia, the aeroplane reached a maximum altitude of 2,500 ft. The speed reached 223 kt. The VFE (maximum flap extention speed) in configuration 1 was 215 kt. The crew consequently heard the overspeed warning. The copilot moved the thrust levers to IDLE, which disengaged the autothrottle and the TOGA LOCK mode. The crew then reengaged the autothrottle, carried out a second approach and landed without difficulty. The proposal of an RNAV VISUAL approach by Tel Aviv ATC to all airlines indiscriminately, departing from the initial concept, the absence of training in RNAV VISUAL approaches at Air France at the time of the event and the short preparation for the approach made by the crew did not allow the Captain to anticipate the PF’s difficulties in performing this unusual approach. In addition poor understanding of A/THR operation and of the importance of following the FD in OPEN DESCENT mode, which led the crew to believe that A/THR would ensure that speed was maintained. Failure to identify the risks associated with the selection of FULL configuration at the end of the downwind leg in OPEN DESCENT mode and inadequate monitoring of the flight parameters led to deviating below the manoeuvring airspeed before the last turn. During the last turn, while the aeroplane had an insufficient energy level, given its configuration, a prolonged pitch up order led to the triggering of the low energy SPEED, SPEED, SPEED warning and then of the ALPHA FLOOR protection. EASA, in partnership with national civil aviation authorities, ensure that training and recurrent training programmes include instruction on the risks associated with the use of OPEN DESCENT mode on approach. Pending the implementation of provisions by ICAO, the civil aviation authority of Israel ensure that the Tel-Aviv ATC only authorises RNAV VISUAL approaches for crews of airlines that have received approval and who have made a prior request for it.